Research Areas Mumbai Campus - No. of seats* M. Phil. Educational Qualifications: The minimum academic qualification for admission to the M.Phil. & Ph.D programmes is a Second Class Master’s or equivalent degree in the relevant subject awarded by a recognised university in India or abroad, with at least an average of 55 percent of aggregate marks, or a grade point average of 3.5 under the seven-point scale of the University Grants Commission (UGC). In the case of SC/ST/OBC(non-creamy layer)/differently-abled candidates, the minimum eligibility is an average of 45 percent of aggregate marks, or a grade point average of 2.50. Candidates who are likely to complete all the requirements of their final year Master’s Degree examinations by July 1, are also eligible to apply for M.Phil, provided they have successfully completed their first year Master's degree. In such cases, admission will be provisional. If a provisionally admitted student successfully completes the admission formalities such as clearing the Research Aptitude Test, but fails to score the minimum required mark/grade at the end of the final year examination of his/her Master’s degree, the offer of provisional admission will be automatically cancelled. 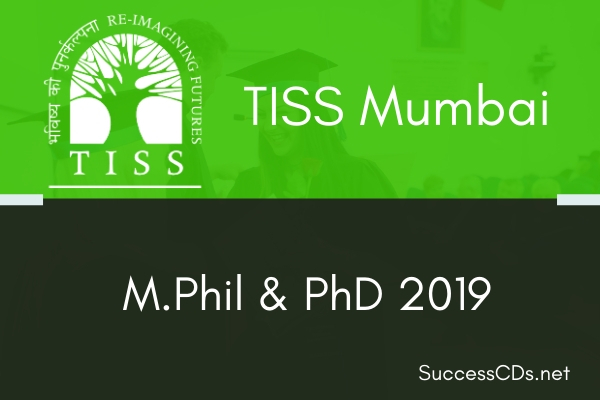 A candidate may apply for a maximum of two programmes from among the different programmes offered at TISS Mumbai, Hyderabad and Tuljapur campuses. Candidates can apply for two programmes within one or across more than one campus. The Research Aptitude Test (RAT) can be taken at any one of the chosen campuses on February 08, 2019. The RAT score is valid across campuses and across two choices. Candidates who apply for more than one campus, if shortlisted, have to travel for Personal interview to both the campuses on designated dates given in this brochure.